Restoration of blocker & trimmer filters on all models of DayStar Solar Filters that are out of warranty. DayStar solar filters older than 10 years do frequently require service. The most common service requirement is the replacement of 2 optical components which age and darken over time. Those are the 'blocker and trimmer' elements. As these two elements age, they darken and lose contrast concentrically from the outside to the inside. A user will notice the view slowly developing poor contrast towards the outside of the aperture. 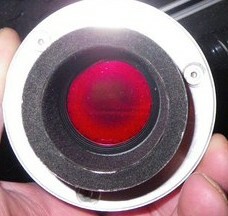 On a visual inspection of the filter, the red side of the filter will show a dark or mottled, donught shaped ring forming from the outside in. The gold side often evidences as speckles or dots in the same ring pattern from the outside in. Please DO NOT open your filter yourself and attempt to perform any repairs on your own. There are no user-servicable parts inside; and simply twisting the optical elements in your filter stack can cause irreperable damage to the system. Replaced blocker & trimmers are warranted for another 10 years when in a Quantum or T-Scanner housing. This is normal age-related element failure which occurs slowly sometime after 10 years. Climate conditions in which the filter is kept will either accelerate or decelerate the speed in which this darkening occurs. A warm and moist environment will speed this deterioration process. Users should try to store the filter in a dry, room temperture environment. Some users in tropical zones use desicant packets in their storage to protect the filter. There is no precise forcast to how long a filter will function. We have found filters kept in constant operation to still be functioning perfectly after 25 years, while others fail in 12. Turnaround time on filter servicing is currently 12 weeks from receipt of payment and filter. If you have a filter in need of service, remove any adapters or removable metal plates. Do not remove the inner, delrin (plastic) plates. Then pack the filter in its original case, (if available) or an appropriately packaged container and ship it insured with a letter telling us what problems the filter has to our address below. Be sure to include your full contact information including postal address, email address and phone number. We also prefer owners to contact us by phone or email to advise that the filter is on the way. Owners outside the US should enter a customs declaration with a value of $200 and a description of "Defective equipment manufactured in the US". Service will be performed only after receipt of payment for service quotation.